A trio of women with Huntington roots were featured on an episode of Steve Harvey’s “Funderdome;” a new reality show on ABC through which entrepreneurs pitch their products to a live studio audience in an attempt to win funding against a competing inventor. Laurie Russo and her daughters, Melissa Wandursky, 28, and Sarah Wandursky, 24, appeared on the reality show that aired on Aug. 13 to promote their hooded infinity sports towel, the HoodiFit. The three took on Tyler Conlin, of Utah, who invented a once-a-week antiperspirant. Although the Huntington natives did not win the funding, Sarah said appearing on Funderdome was a positive experience. Funderdome producers discovered the HoodiFit online after Laurie, Melissa and Sarah started a Kickstarter campaign to fund the product. Sarah said filming the episode was an all-day affair, but that she, Laurie and Melissa only spent about 30 minutes on stage under the spotlight. Both Laurie and Sarah live in Huntington while Melissa, who was born in Huntington, now lives in Jackson, Wyoming. 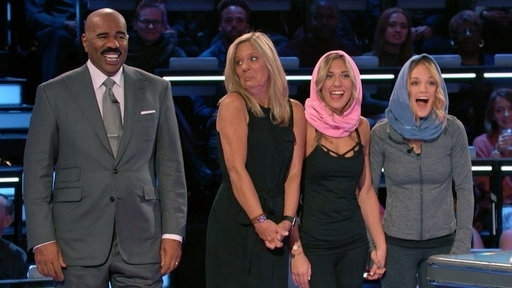 The three women also had the chance to meet the show’s host Steve Harvey, who Sarah said was nice. The HoodiFit design originated when Laurie knitted infinity scarves for her daughters, but evolved into a fitness product out of necessity. The towel is made from 80 percent cotton and 20 percent polyester for stretch, according to Sarah. In addition to being a fun experience, Sarah said being on Funderdome has helped increase interest in the HoodiFit. More info on the HoodiFit can be found at LauraAlison.com.